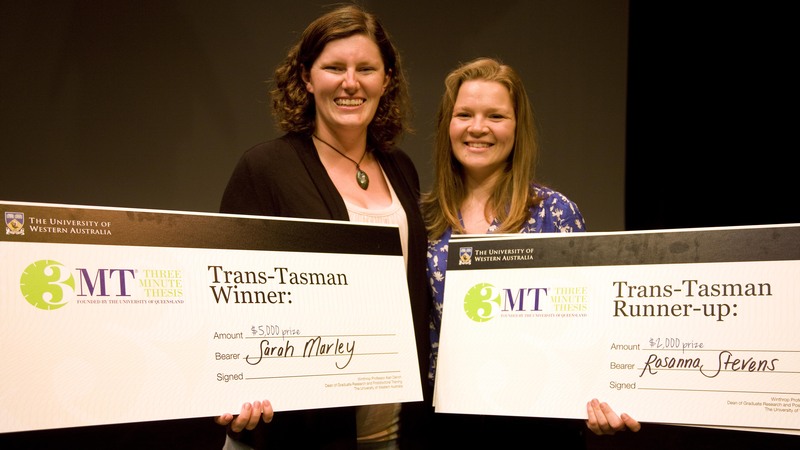 The 3-Minute-Thesis (3MT) competition was developed by the University of Queensland back in 2008. It was intended to be an exercise in communication for graduate students, giving them just three minutes to explain their PhD to a generalist audience. Since then, the competition has expanded to universities around the world. I’ve known about this competition for a couple of years now, after seeing various friends compete to present their own PhD at other universities. I couldn’t wait to become a student myself and give it a go! So when Curtin University emailed around to announce that registration was open for the 2014 competition I immediately sat down, wrote my talk in 20mins, and started practicing! The Curtin heats were a couple of months ago, where I surprised myself by not only making it through to the Curtin Final top ten but also by winning my heat. “A great start,” I thought. “Now back to fieldwork!” as I prepared for the second trip up to the Kimberleys. A few weeks later, I made the special one-night-only trip back from Broome to Perth for the Curtin Final, and won both the Final and the People’s Choice award! Certainly justified the trip down! But the Trans-Tasman Competition was the hardest yet. I was competing with winners, so you can imagine that the standard of talks was extremely high! Most amazing of all was the team spirit – everyone was so nice to each other! After every presentation, the speaker would return to the “green room” amid cheers and high fives from their opposition 🙂 It was a great vibe! As I stepped on stage, I felt such a buzz. I love the work that I do, and the opportunity to talk about it always gets me excited! Quite a far cry from four years ago, when I could barely give a short talk to a group of friends without blushing and stuttering my way through the presentation. So I felt a certain glow of accomplishment at having enjoyed something that just a few years would have terrified me! 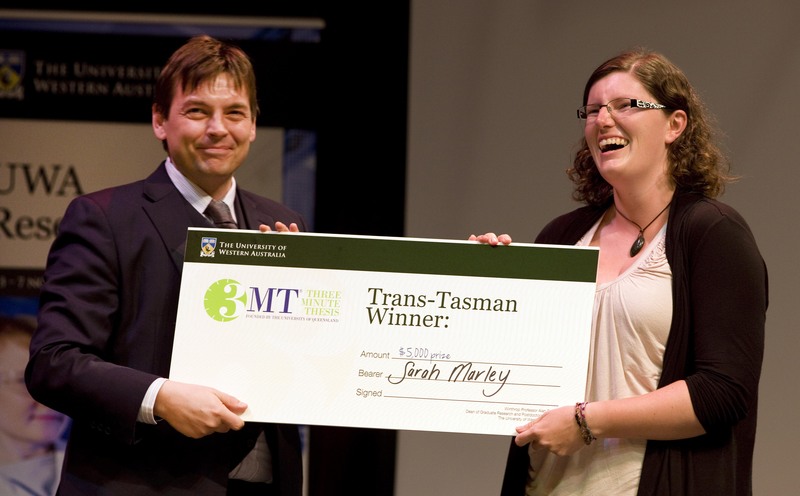 From a happy glow to radiating surprise, I was ecstatic to be chosen as winner of the 3MT – but the whole experience was a delight! From the thrill of presenting to the team spirit backstage to the happiness of making new friends, the whole 3MT journey has been a blast. If you ever have the opportunity to take part I would thoroughly encourage you to do so! Even if you’re not confident of your presenting skills, just ask yourself – when will you get a better opportunity to try? 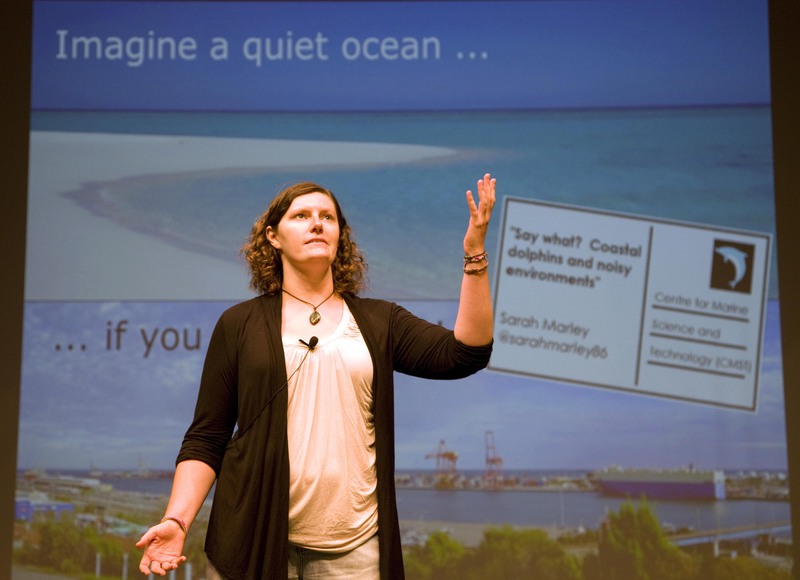 This entry was posted in PhD Life, Research, Science Communication, Underwater Acoustics, Whales and Dolphins and tagged 3MT, bottlenose dolphins, Curtin University, Dolphins, Marine biology, Nature, PhD, Research, Science, Science Communication, Social Media, UWA on November 16, 2014 by Sarah Marley. Well deserved, that’s clear after watching the video! Thank you! It was a real buzz being on stage, let alone getting to talk about my favourite subject! Thank you! I loved the whole experience 🙂 Does your university have 3MT Competition yet?